The Amish Jasper French Country Buffet with Wrought Iron Bakers Rack Top immerses itself in French country style. French country style furniture loves to blend old and new, frilly and plain, traditional and unique with swirls and features that create a romantic look in the room. Jasper has a gorgeous solid wood base with a rim that's sculpted and shaped gracefully. Two cabinets and two drawers offer storage. 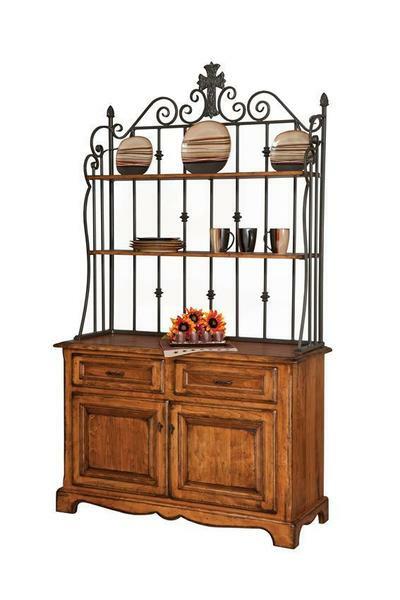 Topped with a wrought iron bakers rack for organizing dishes, coffee mugs and more. The Amish Jasper French Country Buffet is shown here in brown maple wood with antiquated stain. Custom furniture is just a few clicks away. Order online or feel free to contact a Furniture Specialist for help. Thank you for shopping at DutchCrafters, the #1 online retailer of Amish made furniture.